This is an uncommon endemic. As its name suggests, it is found above 1000 meters. This bird was Tonji's "spark" bird. For birders, spark bird is the bird that turns a casual observer into an avid birdwatcher. For most people, the experience usually involves seeing the spark bird. For Tonji however, his spark bird was a bird that we didn't actually see! When we were on Mt. 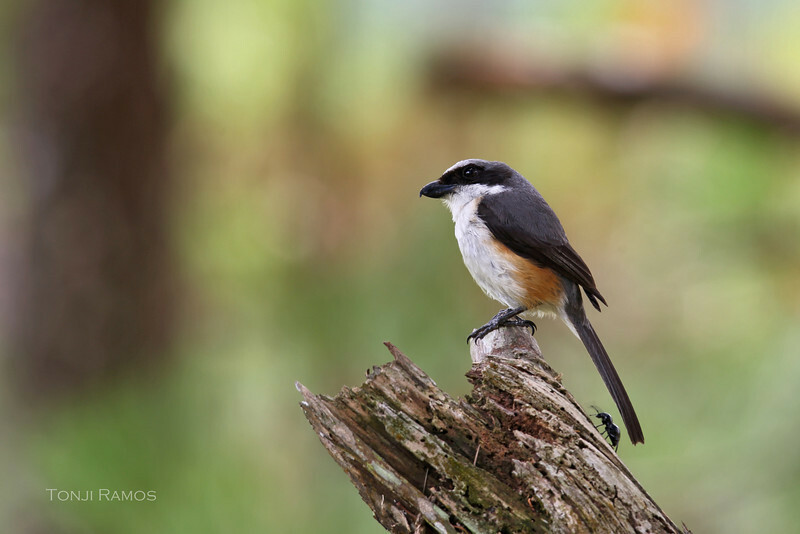 Kitanglad in January 2009, there was a disagreement between birders as to the identity of a shrike. The disagreement lasted a long time, a few beers worth, and was not settled to each sides satisfaction. Tonji was quiet this whole time but was thinking that a photo would have been very definitive. And so, it stuck in his mind that one day he would get himself a photo of a Mountain Shrike! One year later we drove up to Mt. Data and saw a Mountain Shrike on the first day, from the parking lot of the hotel! Its very shy and likes to hide unlike the other Shrikes. We got good views of another one in Mt. Polis in 2012.